A nuclear power plant had experienced blade failure on two of the three exhaust fans multiple times since plant startup. The South fan functioned normally and reliably, regardless of which fans were in operation (Figure 1). 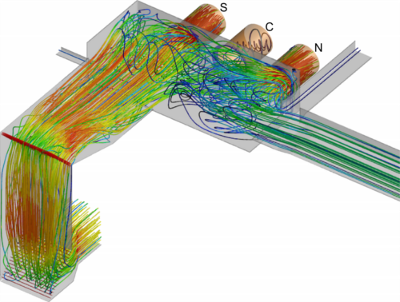 To diagnose the root cause of the Center and North fan failures, field testing and CFD modeling were used in conjunction. 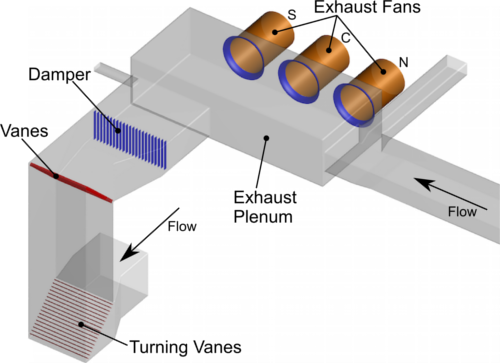 Figure 1: A schematic of the upstream ductwork, exhaust plenum, and three exhaust fans (South, Center, and North from left to right). 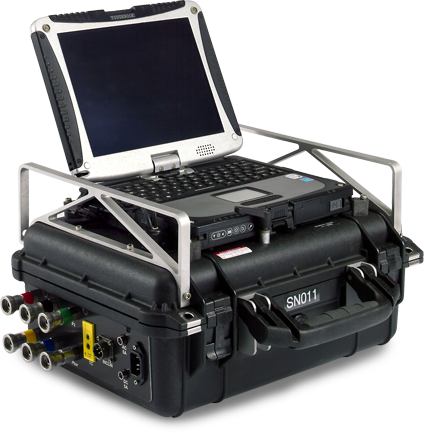 3D velocity measurements were taken on-site to quantify the flow characteristics entering each of the exhaust fans. A high accuracy measurement system (Figure 2) was used. The test data showed that the flow entering the South fan was more uniform and less angular than the flow entering the other two exhaust fans. Even so, the velocity uniformity at the South fan was outside the recommended industry standards (AMCA 803). 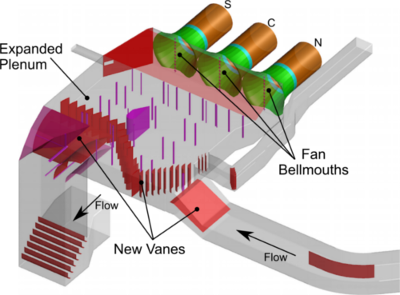 The flow measurements taken at the plant were used as verification for the next phase of the flow model study - CFD analysis. A CFD model was developed of the existing HVAC exhaust system, and the simulations were completed with Azore® CFD Software. As expected from the field data, the flow characteristics to the South fan were more desirable than the flow to the other two fans. This trend held true whether a single or pair of fans was in operation (Figure 3). The South fan (far left) was directly across from one of the inlet branches; hence the flow was straight and more uniform. The flow from the other inlet branch swirled into an undesirable recirculation zone before being drawn into the North exhaust fan (far right). Figure 3: Baseline velocity pathlines with South and North fans in operation show more uniform flow at the South fan inlet (far left) compared to the turbulent flow at the North fan inlet (far right). The next phase of the flow modeling analysis focused on evaluating various design alternatives that would correct the issues identified in the baseline geometry. Specifically, the new design needed to meet the following goals: improve uniformity to meet AMCA 803 guidelines, allow for any combination of fans in operation, and reduce pressure losses. Minimal design changes, such as adding flow control devices (i.e. vanes, baffles) within the plenum and existing ductwork, were considered first (Figure 4). Most of these alternatives had no significant positive effect on the flow characteristics and did not address the inherent imbalance. Figure 4: One design alternative added internal baffles (in pink). There was no significant improvement in flow performance, partly because the size of the plenum was effectively reduced. More aggressive design changes were deemed necessary to resolve the flow problems and prevent future fan failure. An expanded plenum allowed a smoother transition from the ducts to the fans. Larger bellmouths resulted in increased uniformity at the exhaust fan inlets. These changes required rerouting the ductwork farther away from the fan inlets. Because the HVAC system was in a functioning plant, all geometry changes needed to fit within the confines of the available space. 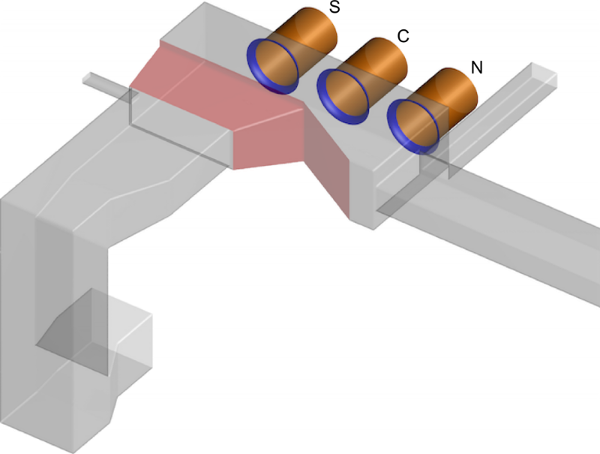 Nearly 100 iterations of rerouted ductwork and enlarged plenums combinations were considered. The final recommended configuration (Figure 5) routed most of the inlet ducts to the rear of the plenum and included flow control devices for improved flow distribution and reduced pressure loss. Figure 5: The recommended design included rerouting of ductwork, an enlarged plenum, extended bellmouths (in green), and the addition of flow control devices (in red). CFD model results show significant differences from the baseline design, notably smoother flow transitions (Figure 6) and lower pressure drops. The swirling flow near the North exhaust fan in the baseline condition has been eliminated. The flow uniformity at each of the three exhaust fan inlets meets the AMCA 803 guidelines for all combinations of operating fans. Figure 6: When the South and North exhaust fans are operating, the final design pathlines show greatly improved flow uniformity and balance. The HVAC geometry updates were implemented in 2014. Field test data was collected and verified the improved flow that was expected from the CFD analysis. For the past year the nuclear power plant has been running without fan failures. Plant personnel have been pleased with the improved flow performance. 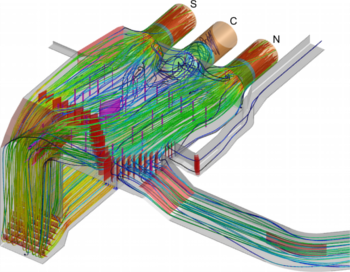 The results of this CFD flow model were presented with DTE at the July 2015 NHUG Summer Meeting in Baltimore. The powerpoint presentation is available to download.